Berlin, September 28, 2017 – Today, the LibreOffice community celebrates the 7th anniversary of the leading free office suite, adopted by millions of users in every continent. Since 2010, there have been 14 major releases and dozens of minor ones, fulfilling the personal productivity needs of both individuals and enterprises, on Linux, macOS and Windows. I wanted to take a moment to remind people that 7 years ago the community decided to make the de facto fork of OpenOffice.org official after life under Sun (and then Oracle) were problematic. From the very first hours the project showed its effectiveness. See my post about LibreOffice first steps. Not to mention what it achieved in the past 7 years. Replace hardcoded “product by Oracle” with “product by %OOOVENDOR”. On a personal note, for me, after years of trying to help with OOo l10n for Hebrew and RTL support, things started to go forward in a reasonable pace, getting patches in after years of trying, having upstream fix some of the issues, and actually able doing the translation. We made it to 100% with LibreOffice 3.5.0 in February 2012 (something we should redo soon…). The 3rd day should have started with a Debian sprint and then a LibreOffice one, taking advantage I’m still attending, as that’s my last day. But plans don’t always work out and we started 2 hours later. When everybody arrive we got everyone together for a short daily meeting (scrum style). The people were divided to 3 teams for translating: Debian Installer, LibreOffice and Gnome. For each team we did a short list of what left and with what to start. And in the end – how does what so there will be no toe stepping. I was really proud with this and felt it was time well spent. The current translation percentage for Albanian in LibreOffice is 60%. So my recommendation to the team is translate master only and do not touch the help translation. My plans ahead would be to improve the translation as much as possible for LibreOffice 6.0 and near the branching point (Set to November 20th by the release schedule) decide if it’s doable for the 6.0 life time or to set the goal at 6.1. In the 2nd case, we might try to backport translation back to 6.0. For the translation itself, I’ve mentioned to the team about KeyID language pack and referred them to the nightly builds. These tools should help with keeping the translation quality high. For the Debian team, after deciding who works on what, I’ve asked Silva to do review for the others, as doing it myself started to take more and more of my time. It’s also good that the reviewer know the target language and not like me, can catch more the syntax only mistakes. Another point, as she’s available more easily to the team while I’m leaving soon, so I hope this role of reviewer will stay as part of the team. With the time left I mostly worked on my own tasks, which were packaging the Albanian dictionary, resulting in https://packages.debian.org/sid/myspell-sq and making sure the dictionary is also part of LibreOffice resulting in https://gerrit.libreoffice.org/#/c/41906/ . When it is accepted, I want to upload it to the LibreOffice repository so all users can download and use the dictionary. That’s the result of work by Silva Arapi, Eva Vranici, Redon Skikuli, Anisa Kuci and Nafie Shehu. The morning stated by taking the bus to Kini beach. After some to enjoy the water (which were still cold in the morning), we sat for talking about the local Debian community and how can we help it grow. The main topic was localization (l10n), but we soon started to check other options. I reminded them that l10n isn’t only translation and we also talked about dictionaries for spell checking, fonts and local software which might be relevant (e.g. hdate for the Jewish/Hebrew calendar or Jcal for the Jalali calendar). For example it seems that regular Latin fonts are missing two Albanian characters. We also talked about how to use Open Labs to better work together with two hats – member of the local FOSS community and also as members of various open source projects (not forgetting open content / data ones projects as well). So people can cooperate both on the local level, the international level or to mix (using the other’s project international resources). In short: connections, connections, connections. Another aspect I tried to push the guys toward is cooperating with local companies about open source, whether it’s the local market, the municipal and general government. Such cooperation can take many forms, sponsoring events / giving resources (computers, physical space or employee’s time) and of course creating more jobs for open source people, which in turn will support more people doing open source for longer period. One of the guys thought benefit the local community will benefit from a mirror server, but that also requires to see the network topology of Albania to make sure it makes sense to invest in one (resources and effort). We continued to how it would be best to contribute to open source, mostly that Debian, although great isn’t always the best target, and they should always try to work with the relevant upstream. It’s better to translate gnome upstream then sending the Debian maintainer the translation to be included in the package. That shortcut can work if there’s something urgent like a really problematic typo or something what unless done before the release would require a long long wait (e.g. the next Debian release). I gave an example that for important RTL bugs in LibreOffice I’ve asked Rene Engelhard to include the patch instead of waiting for the next release and its inclusion in Debian. Later that day I did another session with Redon Skikuli to be more practical, so I started to search on an Albanian dictionary for spell checking, found an old one and asked Redon to check the current status with the guy. And also check info about such technical stuff with Social Sciences and Albanological Section of the Academy of Sciences of Albania, who is officially the regulator for Albanian. During Debconf17 I was asked by Daniel Pocock if I can attend FOSScamp Syros to help with Debian’s l10n in the Balkans. I said I would be happy to, although my visit would be short (2.5 days) due to previous plans. The main idea of camp is to have FOSS people meet for about 1 week near a beach. So it’s sun, water and free software. This year it takes place in Syros, Greece. After take the morning ferry, I met with the guys at noon. I didn’t know how would it be, as it’s my first time with this group/meeting, but they were very nice and welcoming. 10 minutes after my arrival I found myself setting with two of the female attendees starting to work on Albanian (sq) translation of Debian Installer. It took my a few minutes to find my where to check out the current level1 files, as I thought they aren’t in SVN anymore, but ended up learning the PO files is the only part of the installer still on SVN. As the girls were quick with the assinged levle1 sublevels, I started to look for the level2 and level3 files, and it was annoying to have the POT files very accessible, but no links to the relevant git repositories. I do want to have all the relevant links in one central place, so people who want to help with translation could do that. While some of the team member just used a text editor to edit the files, I suggested to them using either poedit or granslator, both I used a few years ago. Yaron Shahrabani also recommended virtaal to me, but after trying it for a while I didn’t like it (expect it’s great feature showing the diff with fuzzy messages). For the few people who also have Windows on their machine, both poedit and Virtaal have windows binaries for download. So you don’t have to have Linux in order to help with translations. I found it interesting to see the reactions and problems for the team to work with the PO files, and most projects now use some system (e.g. Pootle) for online web translation. Which saves some of the head ace, but also prevents from making some review and quality check before submitting the files. It’s a good idea to explore this option for Debian as well. A tip for those who do want to work with PO files, either use git’s diff features or use colordiff to check your changes (notice less will require -R parameter to keep the color). Some files are still work in progress and will be completed tomorrow. My goal is to have Albanian at 100% during the camp and ready for the next d-i alpha. I must admit that I remember d-i to have many more strings as part of the 3 levels, especially levels 2+3 which were huge (e.g. the iso codes). Except all the work and FOSS related conversations, I found a great group who welcomed me quickly, made me feel comfortable and taught me a thing or two about Greece and the Syros specifically. 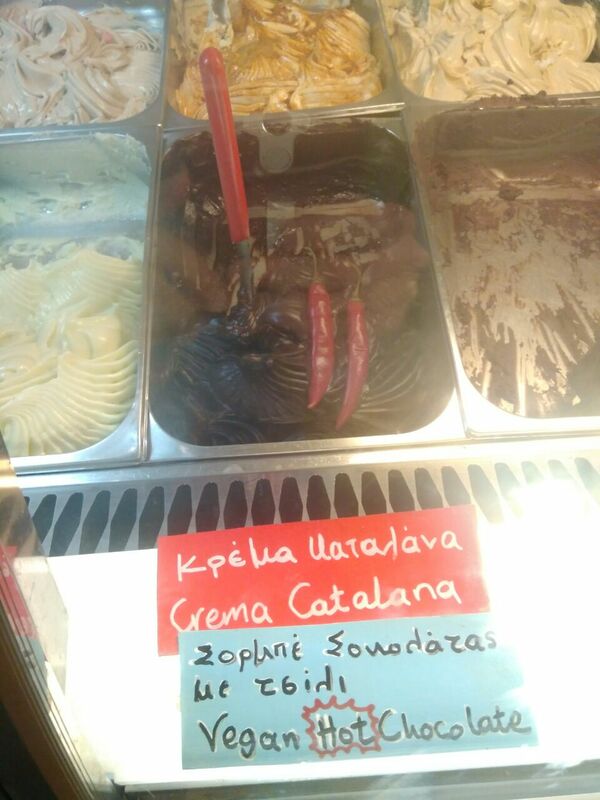 TIP: try the dark chocolate with red hot chili pepper in the icecream shop. LibreOffice 4.0.0 will be released soon, and it’s a good time to summarize its RTL status. Similar to 3.5.0, the RTL work started with LibreOffice conference in October, showing the current state (see LibreOffice RTL status 2012 presentation) and listing the top problems. The main goal of this talk is to raise awareness to RTL issues and recruit developer to help fix them. This was exactly what happened with fdo#44657 which is about Calc not having a scroll bar in RTL user interface. This way RTL bug #1 for almost a year. In total, version 4.0.0 has 8 bugs fixed (mainly Calc, Presenter Console and toolbars). In addition it has 5 language specific bugs fixed. Full lists are at https://wiki.documentfoundation.org/RTL_Bugs#4.0.0 and https://wiki.documentfoundation.org/RTL_Bugs#4.0.0_2. Beside working on fixing bugs for the 4.0.0, another focus was put on making sure the fixes are available for the 3.6.x users. This resulted with cherry picking 11 out of 13 bug fixes (part of 3.6.4 and 3.6.5 releases). More fixes are already underway in the master branch, and will also be part of 4.0.1 maintenance release (full list at https://wiki.documentfoundation.org/RTL_Bugs#4.0.1). Beside thanking the core developers for their help (patches, code review), I’d like to thank the guys from The National Program for Free and Open Source Software Technologies (Motah) at King Abdulaziz City for Science and Technology (KACST) in Saudi Arabia, which have joined the RTL team during this release, and their effect is well noticed. Despite all the work done, we still have a share of RTL bugs for the next release, these are the 7 top priority RTL bugs, any help would be appreciated. As LibreOffice is approaching its final 3.5.0 release, I’d like to sum up the RTL status for RC1. So far, 6 RTL related bugs were resolved in the 3.5 cycle (#32530, #34222, #40950, #43790, #43793, #44078), and a few minor issues reported directly to the developer’s mailing list got quick responses. Most importantly, the new features of page break and header/footer not only support RTL but actually looks good. During the LibreOffice conference I was suggested to help with these features, providing feedback, and I’m glade the needed attention was given to it. Besides that, a few l10n and translation issues were solved in the process of doing the Hebrew translation (which also reflects on other RTL languages). At a few cases, these issue because a general l10n issues which affects all the languages. In general, I found the core developers responsive to mails about RTL support. I’m sure the talk about RTL problems during the conference helped, as well as being more active in the project and having more personal acquaintance with the developers.